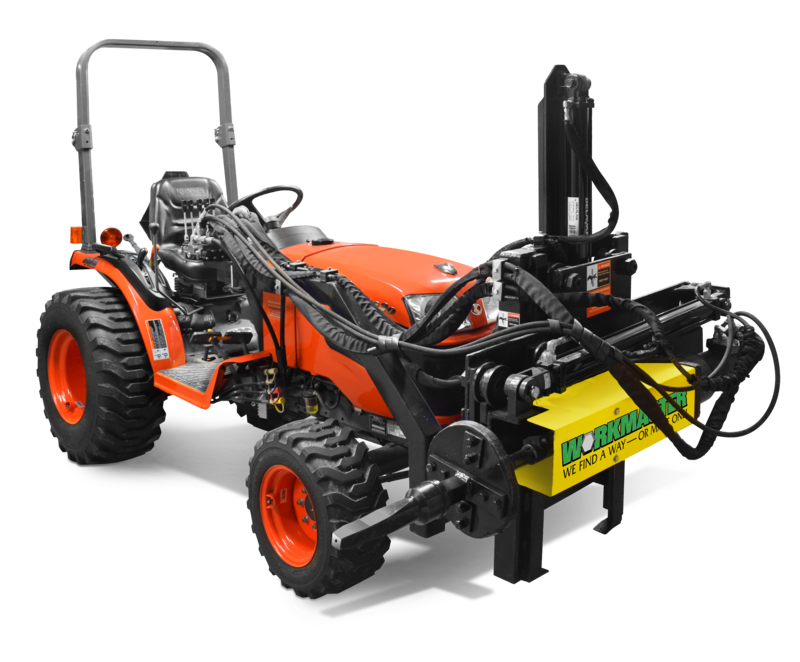 The WORKMASTER® Wellman Railcar Gate Opener features a hydraulically operated gate opening drive shaft mounted to the front of a B2320 Kubota Tractor. The slide gate opener is mounted to the tractor allowing it to rise, fall, rotate, extend, retract, and pivot on an isolating hinge with respect to the tractor. The operator sits forward on the tractor and operates while moving parallel to the rail line. The opener is then able to access the pinion shaft of the slide gate of the railcar regardless of whether the tractor is elevated above or below the rail line, and regardless of whether the tractor is inclined toward or away from the railcar. When the drive fitting has engaged the pinion shaft of the slide gate, the opener rotates so as to open or close the slide gate at a low speed high torque output of 900 ft lbs, or a high speed low torque output of 450 ft lbs. Gate opener is mounted to the front of a B2320 Kubota Tractor. Ergonomically positioned self-closing, speed control throttle; Forward/Reverse hydraulically controlled lever control; height adjustment lever controls easy to reach and operate. Comes standard with a high-speed 450 ft-lb and a low-speed 900 ft-lb torque range. Enables one worker to easily drive and position the drive shaft in line with capstans thereby improve safety, increase productivity, and reduce manpower planning.